Shakin & Bakin Foodie Blog: Gorton's Makes Family Dinner Night Delicious! Gorton's Makes Family Dinner Night Delicious! Have you all heard the news? 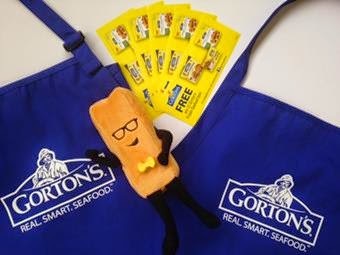 Gorton's has a brand new line of Smart & Crunchy Fish Sticks and Fillets. They've reinvented their iconic Fish Stick, to create the Fish Stick 2.0. The new Smart & Crunchy Fish Sticks and Fillets are made from 100% Alaska Pollock and are never fried, so they have 50% less fat than Gorton’s regular breaded Fish Sticks and Fillets. And, thanks to a seasoned panko crumb, they have the same great taste and crunch you and your family have come to love from Gorton's. All new Smart & Crunchy Fish Sticks offer a mealtime solution that you can feel great about serving and your family will truly enjoy. 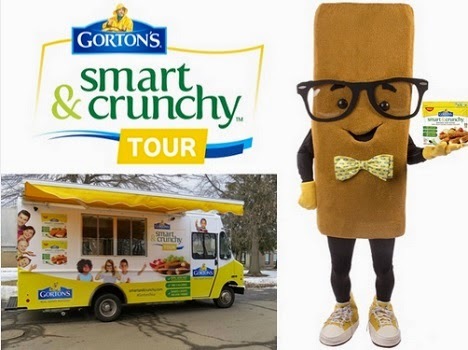 Gorton's is spreading the news with their all new Smart & Crunchy Tour across America. Check out the #GortonsTour stops on their website, smartandcrunchy.com and while you are there, check out their delicious recipes too! Recently we were sent a Gorton's Pack so that we could do a review for all of you. We received some free product coupons, an adult apron, a child's apron and an adorable plush fish stick toy which my little grand daughter quickly snagged up! 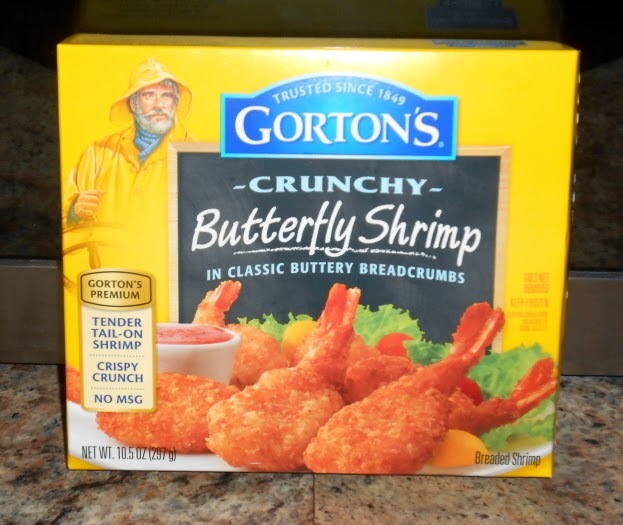 We headed to the grocery store and picked up a box of the Gorton's Crunchy Butterfly Shrimp and a large bag of the Gorton's Battered Fish Fillets. Our local grocery store didn't have the new Smart & Crunchy products in yet...so this is why I selected these particular two products to review for all of you. One of the things I love about the Gorton's Fish & Seafood products is the simple fact that you can make them straight out of the box, no additional ingredients are needed and in less than 30 minutes lunch or dinner is on the table. If you like to get creative, you can use their products in a wide variety of recipes and you can grab those recipes directly from the Gorton's web site. Since the princess is taking swimming lessons after school during the week we need to have quick & easy dinners during the week. I decided to make the Crunchy Butterfly Shrimp and the Battered Fish Fillets for dinner the other night and they were a big hit! I served some Harvard beets, french fries and fresh garden salads right along with the fish & seafood products and it was a dinner that my entire family enjoyed! We simply opened up the packages and placed the shrimps and fish fillets in a glass baking dish and baked them in our oven at 425 degrees for 15 minutes or less. (baking time depends on the product). They came out of the oven perfectly browned and were crunchy. There was nothing soggy about them at all and they had a very nice flavor and texture. Next week we are going to try out the Gorton's Fish Tacos recipe that you can find on their web site. They look totally delicious!!! Plus, visit the Gorton's site for some printable money-saving coupons that you can take to your local store! Sweepstakes: Enter the Gorton's Smart & Crunchy Sweepstakes for a chance to win 1 in 4 ultimate family vacations! See their website for additional information and to enter the Sweepstakes. Giveaway: One lucky winner is going to win two full-value product coupons, an adult-size apron, a child-size apron and a Smarty Crunchman plush toy. (note: photo shows multiple coupons but you will ONLY receive (2) in your prize package. Thank you Gorton's! Giveaway Details: This giveaway is open to residents of the USA ONLY who are age 18 and over. Please read the Terms of Service and Disclaimer Policy before entering. You must be a PUBLIC FOLLOWER of this Blog to have your entries count in my giveaways. (Follow via Google Friend Connect) All non-blog followers will have their entries disqualified after the giveaway closes. This giveaway will close on April 17th, 2015 at midnight EST time. I would like to make the Down Home on the Ranch Fish Canoes, they look so fresh and light. Maple Glazed Grilled Salmon Fillets sound delicious! I want to try the pow pow popcorn shrimp, I think this would be a hit at the church potluck dinners. Something I have never seen there. And I have been at a lot of them. I want to try the pow pow popcorn shrimp for the church potluck dinners. It will be something I have never seen there. The Fish Caesar Salad wraps look pretty good to me. The Greek Pitas look good, too. I love those kind of quick wraps! The other giveaway I entered today: The Scalisi Skin care giveaway. I pinned/liked the pin for Banana Whoopie Pies. Looks yummy! I would love to try the Fish Taco Salad. I entered the Scalisi Skincare Cleanser and Exfoliator giveaway on TCC. I repinned your pin "Here is another bunny template found online, cute bent ear!" The fish taco salad looks good. I am most interested in the recipe for the potato munch crunch. I would like the fish stick taco recipe. I really want to try the Gordon's greek salad fish pita recipe that sounds super good. I would love to make the recipe Grilled Gluten Free Flatbread for dinner. I'd like to try the Shrimp and Vegetable Tostadas. I would like to make the recipe for Fish Caesar Salad Wraps. I entered the Dial Boutique Collection Liquid Soap giveaway on TCC. I would like to try the Greek Salad Pita recipe. I entered the Sesame Street Elmo DVD giveaway on TCC. I entered the Winning Moves Game Night Giveaway. I would like to try the Fish Parmesan with Pasta Primavera recipe. I entered The Pink Monogram Custom Cosmetic Cases. The Crunchy Butterfly Shrimp Wrapped in Bacon & Cheese sounds good. I like the crunchy fillets and would like to try the fish Caesars salad wrap recipe. Id also like to try the popcorn shrimp. I entered the gortons seafood giveaway and pediped shoes giveaway. I entered the Gorton's Fish and Seafood giveaway on TCC. Today, I also entered the Dial Boutique Collection giveaway on TCC. I'd like to make Scampi Shrimp with Broccoli and Linguine. Publicly following Shakin & Bakin Foodie Blog with Google Friend Connect. Entered the Exodus: Gods and Kings giveaway at Two Classy Chics. I entered the Designer Perfume from Scentbird giveaway on TCC. I'd love to make the Tex-Mex Mango and Black Bean Salad with Smart & Crunchy Breaded Fish Fillets recipe. I follow through Google Friend Connect (Jennifer Tilson). I entered the pediped giveaway on TCC. I'd like to make the Smart & Crunchy Fillets with Fresh Mango Salsa recipe. Thanks. I entered the Spring Themed Ring Pops giveaway today. I would love to make the Shrimp and Vegetable Tostadas. I entered the Pediped Children's Shoes giveaway on TCC. I entered the Easter weekend flash cash on TCC. Today, I entered the JORD Watch giveaway, too. I entered the master lock security file box giveaway on TCC. I also entered the Hampton Creek JustMayo giveaway. I entered the Hampton Creek JustMayo Prize Pack giveaway on TCC. I love to try the pow pow popcorn shrimp. I entered the Scalisi skincare giveaway on TCC. I also entered the other Gorton's giveaway on TCC. I entered today: The Scalisi Skin care giveaway. Enjoy this refreshing and simple salad topped with NEW Smart & Crunchy Fillets. It's Taco Tuesday with double the crunch! I entered the custom cosmetic cases 3 pc. set giveaway on TCC. I also entered the Scalisi Skin Care giveaway. I would like to try the fish stick taco salad recipe. The other Gorton's Fish and Seafood on TCC blog. I entered the Dial Boutique hand soap giveaway at TTC. I entered the Purex Crystals ScentSplash giveaway at TCC. The Caesar wraps are what I want! I also entered the giveaway for the Colgate Enamel Health Prize Pack on TCC. The Caesar Wrap looks delicious! So many tasty recipes... the Fish Caesar Salad Wraps look amazing! I also entered the giveaway for the JORD Watch. I entered The Hobbit: The Battle of The Five Armies Blu-Ray on SNB. I entered the Golden Girl Granola giveaway on TCC. Today, I also entered the Golden Girl Granola giveaway. I entered the Hampton Creek Just Mayo Prize Pack giveaway on TCC. I also entered the Hampton Creek Just Mayo giveaway today. I entered the Colgate Enamel Health giveaway on TCC. I entered the UV Blocker Folding Umbrella giveaway on TCC. I also entered the Golden Girl Granola giveaway today. I entered the TCC The Essential Diaper Wallet giveaway. I would love to try the Parmesan Primavera . The Fish Caesar Salad wraps sounds so good love to make them. I entered the Jord Wood Watch giveaway on TCC. Today, I also entered the Scalisi Skin Care giveaway on TCC. I entered the Dial Miracle Oil Hand Soap giveaway on TCC. I entered the Purex crystals scentsplash giveaway on TCC. Today, I also entered the Milton's Gluten-free Crackers giveaway on TCC. I entered the Gorton's Fish & Seafood Prize Pack giveaway on TCC. I entered the Dropprice $175 Target Gift Card Giveaway at TCC. I entered the Dial Miracle Oil Liquid Hand Soap giveaway on TCC. Today, I also entered the JORD Watch giveaway on TCC. The Pink Monogram Custom Cosmetic Cases giveaway. I entered the TCC Bazooka Joe giveaway. I entered the P&G Stock Up Event WalMart G/C on TCC. Today, I entered the giveaway for Bazooka Joe candy/gum on TCC. I entered the Milton's gluten free cracker giveaway on TCC. I entered the Terrikelly Flip Flops giveaway on TCC.